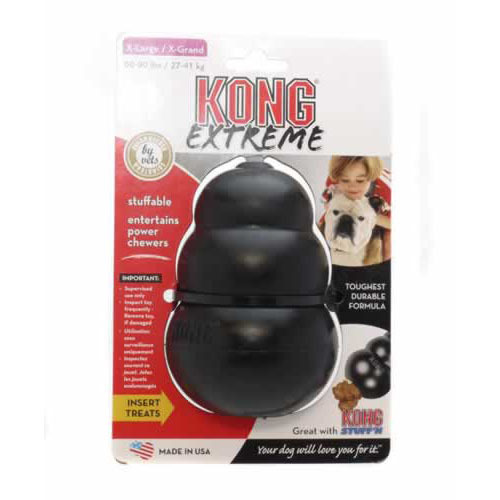 The KONG Extreme Extra Large is made from KONG's exclusive, super bouncy, black natural rubber compound which is ultra strong and formulated for large, tenacious power chewers. Virtually indestructible and comes in 5 chew friendly sizes. The KONG is a marvellous invention, it provides excellent stimulation and gives an instant reward for all your dogs hard work. By filling the KONG Extreme Extra Large with various tasty goodies, such as hot dogs, cheese, Marmite, even your dogs own food, you will provide your dog with a long lasting boredom buster!